This image shows a patch of the sky centered on the Orion constellation and is based on observations performed by ESA's Planck satellite at microwave and sub-millimetre wavelengths. The colour scale represents the emission from dust, a minor but crucial component of the interstellar medium that pervades our Milky Way galaxy. The texture indicates the orientation of the Galactic magnetic field. It is based on measurements of the direction of the polarised light emitted by the dust. The red clumps at the centre of the image are part of the Orion Molecular Cloud Complex, one of the most nearby large regions of star formation, only about 1300 light-years away from the Sun. The most prominent of the red clumps, to the lower left of centre, is the famous Orion Nebula, also known as M42. This is visible to the naked eye in the constellation Orion, just below the three stars forming the ‘belt’ of the mythological hunter. 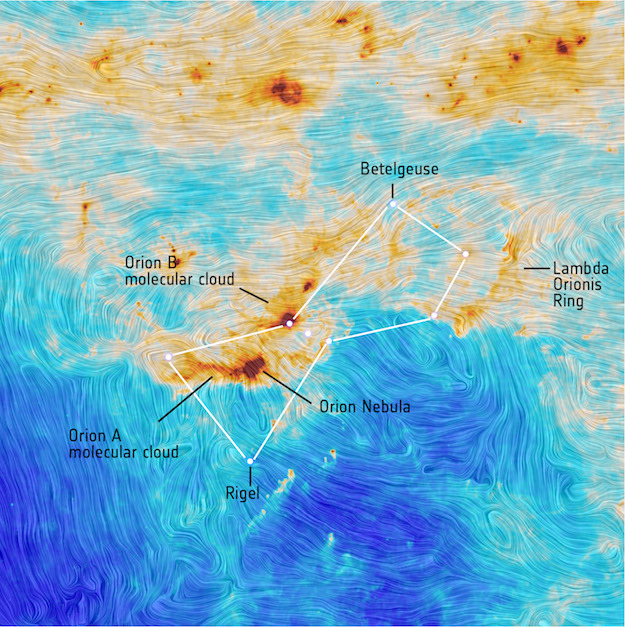 In this annotated view, the location of the brightest stars of Orion are indicated, as well as the outline of the constellation and the position of the Orion Nebula and other clouds. The image without annotation is available here. The emission from dust is computed from a combination of Planck observations at 353, 545 and 857 GHz, whereas the direction of the magnetic field is based on Planck polarisation data at 353 GHz. The image spans 40° on each side.